Salesforce.com has completed the first integration between its HR software acquisition and its core CRM system, and one analyst thinks the technology holds lots of possibilities for the future. Salesforce.com today rolled out the first integration between Rypple, its recent human resources software acquisition, and its core CRM tool, further extending its concept of the “social enterprise” to a wider base of users. Salesforce.com is not the only enterprise software vendor to extend its reach into human resources software. SAP recently acquired SuccessFactors and Oracle bought Taleo. It’s just the fastest at integrating the spoils of its acquisitions, according to one of Rypple’s founders. “While our competitors are worrying about where the bathrooms are [at their new acquisitions], we’re revolutionizing the space,” said Dan Debow, vice president of Rypple. That integration, for now, is limited to extending Rypple’s performance management functionality to Chatter, Salesforce.com’s collaboration tool, and its core sales force automation system. Rypple’s core functionality is providing feedback and performance evaluations for company employees. In the six weeks since the acquisition was announced, the combined companies extended the Salesforce.com custom object architecture to Rypple. Now, for example, a sales executive can give feedback to a sales rep after a successful presentation. He can provide that feedback within Rypple or through Salesforce.com, and he can also extend the feedback to Chatter so colleagues and supervisors will see the comments. Rypple also allows users to bestow badges, similar to other social media tokens. For example, a supervisor could give an employee a “ninja” badge for helping with the presentations. Badges can be customized for more formal and less formal organizations, Debow added. 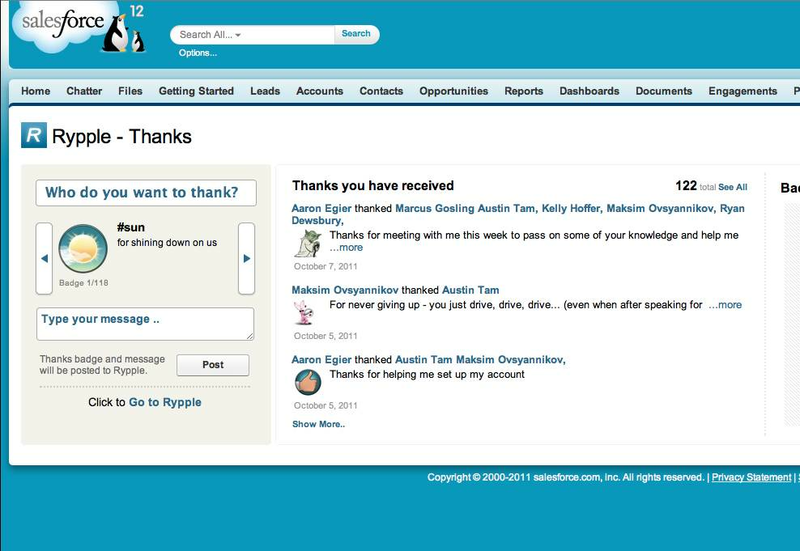 Salesforce.com’s entry into human capital management and performance reviews offers some real potential, according to Esteban Kolsky, principal and founder of ThinkJar LLC, a CRM and social networking consulting firm in Reno, Nev.
For example, a customer who calls into the contact center and interacts with an agent could be surveyed. Those results could be fed into Rypple, providing insight into the behavior of well-performing agents and helping users recognize performance and best practices. Similarly, account managers could ask customers to rate or give feedback on sales reps and feed that into performance reviews, Kolsky said. Rypple, which based its development on a consumer applications model -- with rapid upgrades and frequent testing of new functionality -- will have to adjust its development schedule now that it’s part of Salesforce.com. Salesforce releases upgrades three times a year. Salesforce.com also made its Site.com product generally available today. Built upon the Force.com Sites tool, Site.com allows business users like marketers to update websites rapidly through drag-and-drop forms, templates that allow Web pages to remain consistent across sites and social networks like Facebook, while offering collaboration through Chatter. Hewlett-Packard, for example, has built 3,000 Web pages with Sites.com, according to Salesforce.com. Pricing for Site.com starts at $1,500 a month for a site, plus an additional $25 per user per month for users with publisher access and $5 a month for users with contributor access. Rypple is generally available for a fee of $5 per user per month. The integration between Rypple and Salesforce.com will be available in April at no charge to joint customers of Salesforce.com and Rypple. According to Debow, at the time of the acquisition, 88% of Rypple customers were also Salesforce customers.